Mahi-mahi Sicilian Style | Pasta & Co.
Beautiful and powerful, Mahi-Mahi is one of my favorite fish. Grilled, baked, steamed or simmered in white wine, it’s always delicious. 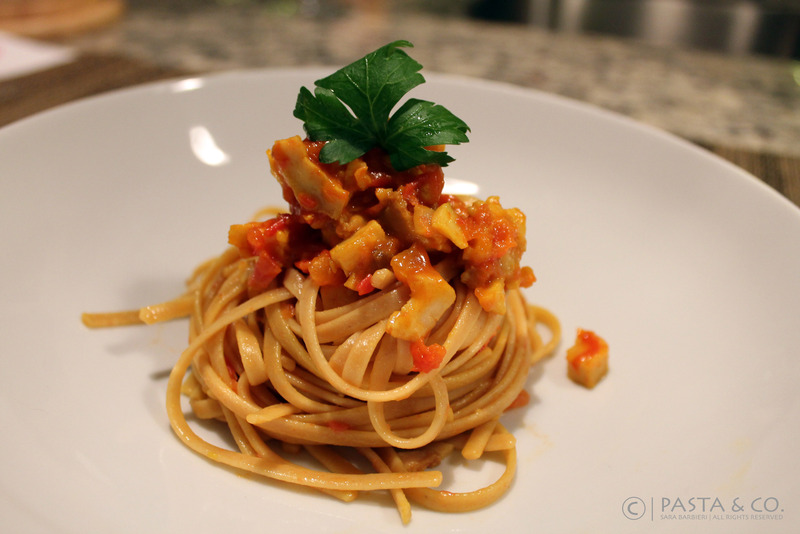 Today I had a portion in the fridge and came up with this Sicilian inspired sauce to dress my whole wheat linguine. Sicilian Fishermen would actually use only the parts of the fish located near the head and the tail, but it’s much more likely for all of us to have a portion in the fridge rather than the whole beast, uh? Brilliantly colored, with an iridescent bluish-green and gold body, golden-yellow fins, and a golden tail, Mahi-Mahi is a striking fish to see. Mahi-mahi is a strong swimmer, capable of swimming up to 50 miles an hour. The name indeed means “very strong” in Hawaiian. 1) Wash the fish, tap dry and chop it in tiny little cubes. Clean the tomatoes and try to remove as many seeds as you can. Chop finely the tomatoes. 2) Fill a pot 2/3 of the way with salted water and bring it to boil. 3) Next, warm 2 tbsp of extra virgin olive oil. Add garlic, cook slowly and gently till light gold. Add the chopped tomatoes and sauté until tender, about 4-5 minutes. Remove the garlic. 4) Add the cubed mahi-mahi, cook for 2 minutes. Pour in 1/2 glass of prosecco and simmer until cooked, about 4 minutes. 5) Drain the pasta, toss it in the sauce and serve optionally garnished with fresh chopped Italian parsley.